Boats, big pink birds, and a swim in a mangrove spring all followed by a play on the beach. What could be more fun for the kids (and adults, too)? If this sounds like the kind of day your family would enjoy, then a trip to Celestún should definitely be on your radar when visiting Mérida. Celestún is a small town on the coast some 95 km west of Mérida and can easily be visited as a day trip; but there are some lovely beachfront guest houses, too. Leave Mérida early to make the most of your day. Once you arrive in Celestún you’ll need to decide if you would rather start your tour by the bridge or from the beach. I’ve taken both trips with my family and can tell you that there are pros and cons to both options. Everything is more obviously marked and explained. 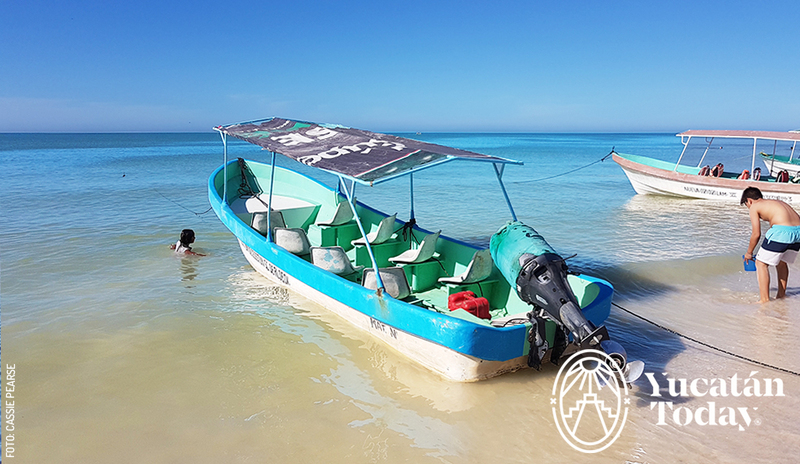 You arrive, pay $1572 pesos per boat (up to 6 passengers; if you are fewer than that you can see if other people in line want to join you) and head off for your 1 h. 30 min. tour. There are bathrooms here, a small snack shop, and a souvenir shop. If you head to the beach to start the tour, find your way to the hut on the beach: there are clear signs and you will most likely be ‘found’ by the organizers. Celestún is small enough that you’ll easily figure this out. It costs the same as from the bridge, but it lasts longer because you’re starting from further away. By starting on the beach you pass the point where salt and ‘sweet’ (fresh) water meet, and you probably see more wildlife, too. However, it can be seriously choppy and fast going from the beach. If you’re after a more serene trip, the bridge is your better bet. We didn’t feel the need for life jackets for the kids when we began our tour at the bridge because the water is calm and shallow. When we started at the beach, we absolutely put the kids in life jackets because the water was so choppy. When are the Flamingos in Celestún? 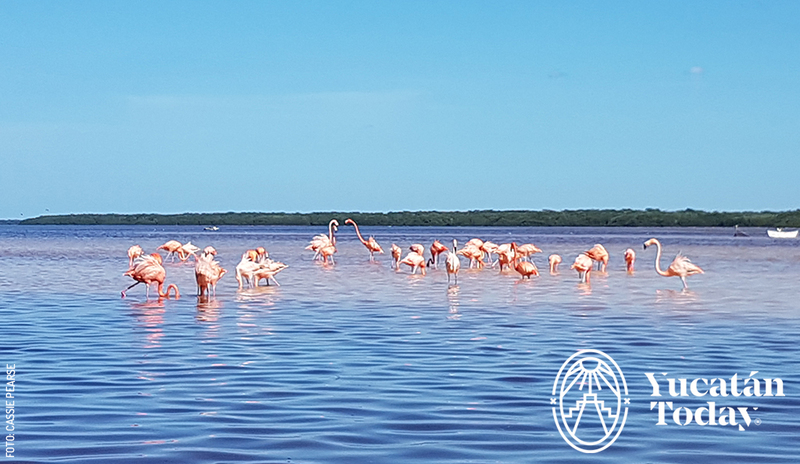 Obviously, no one can guarantee flamingos since they’re wild birds but I haven’t met anyone who hasn’t seen them when visiting Celestún. The best flamingo viewing is considered to be between November and April. 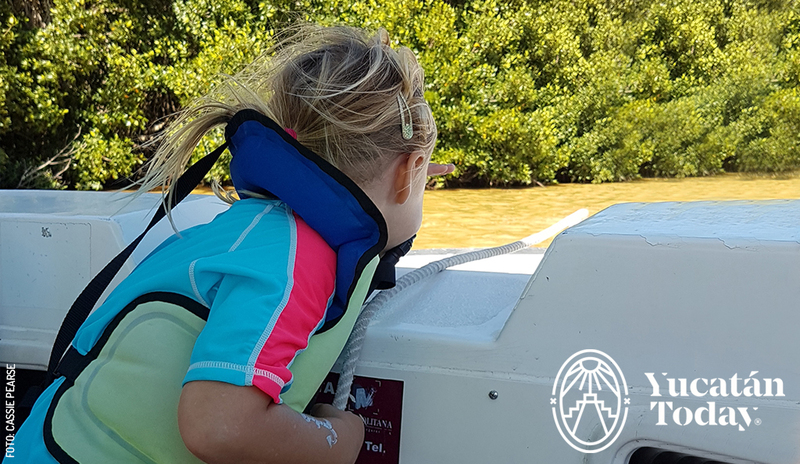 I’m not sure if it’s possible to have your fill of watching the flamingos, but once your time is up, you then get a fun trip speeding along the edge of the mangrove before a sharp turn into it, something my kids thought was absolutely hysterical and incredibly exciting. Once inside the mangrove, you’ll see the beautiful tree formations, many other varieties of birds, enormous termite mounds, and maybe even a crocodile. The tour also consists of a stop to walk around a small section of mangrove, and swim in a small spring. Have insect repellent handy for this part of the tour. Once you’re done in the mangrove, sadly, it’s time to head back. Your only problem now is that it’s time to figure out lunch! In my opinion, the best option is to head to the beach where you’ll be able to choose from reasonably priced seafood restaurants or typical local snacks such as “marquesitas” (a sort of filled waffle / cone), ice-creams or local desserts. We tend to have a sit down meal and then hang around long enough that we need a marquesita before heading home again. Celestún has a beautiful beach. If you’re lucky you may have the beach to yourselves but even if you don’t then you can simply walk a little way away from the restaurant spot and enjoy the peace and quiet of your own, almost private beach! The biosphere is open daily from 8 am – 5 pm in winter and 8 am – 6 pm in summer. There are three routes heading west from the Periférico: through Hunucmá, through Umán, or the shorter route in between. Check our map for details.